Hamamatsu Japan – All You Need To Know Before Your Trip! El Nido Palawan – El Nido is a pretty popular town in the Philippines. 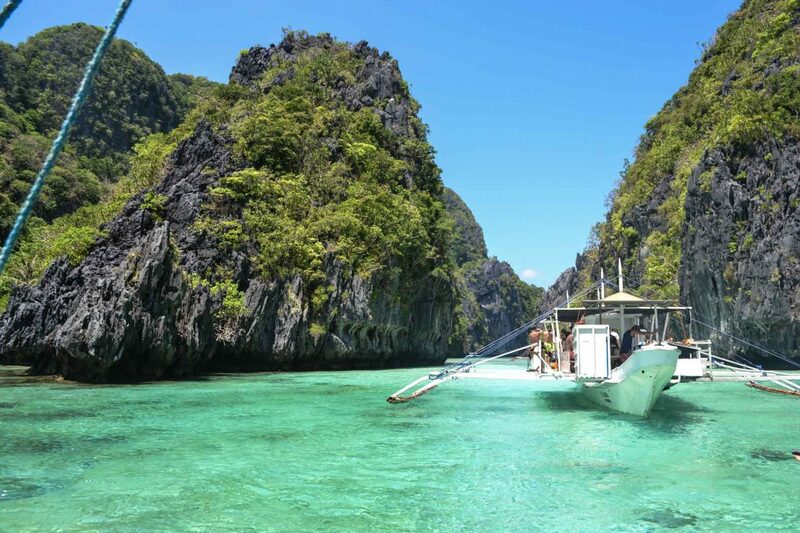 Situated in the archipelagic province of Palawan, El Nido has a natural splendor that will blow you away. 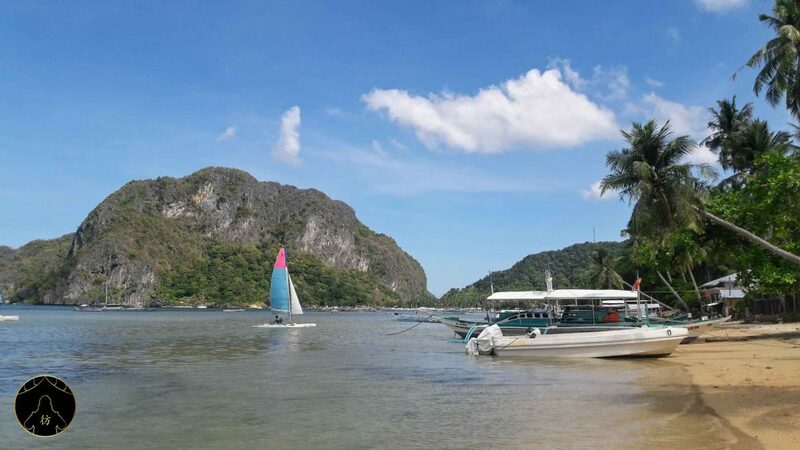 I can say I traveled around Southeast Asia rather extensively so if I had to pick the most outstanding experience to tell you about as far as heavenly beaches are concerned, I’d pick el Nido without a doubt. 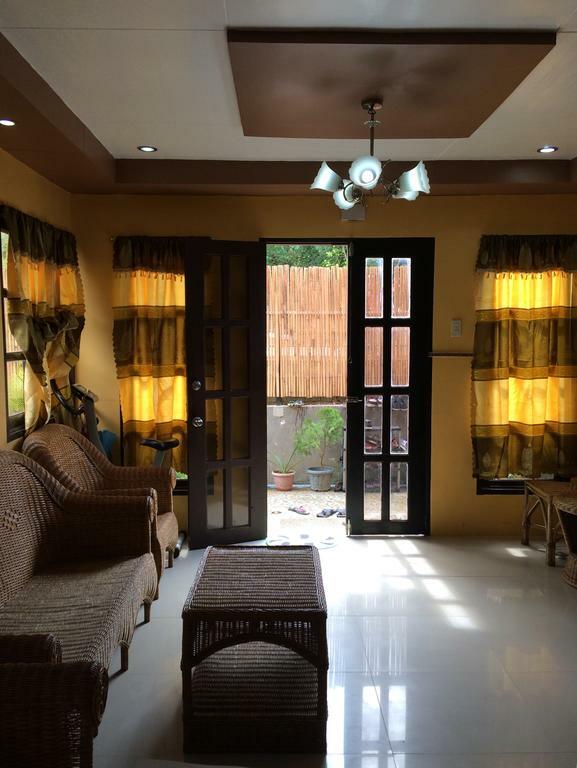 So let’s jump right in with a few general tips and directions to get to El Nido and find the right accommodation. We’ll review the best attractions to visit once you’re all set! 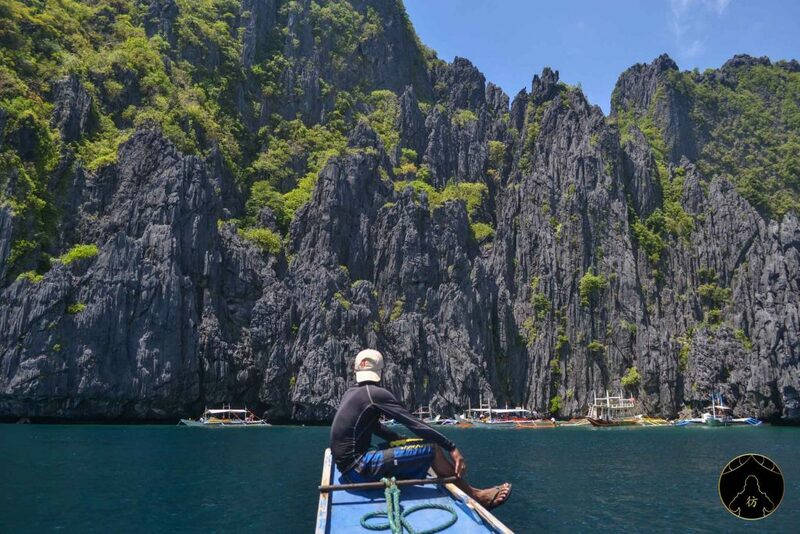 El Nido Palawan – How to Get there? 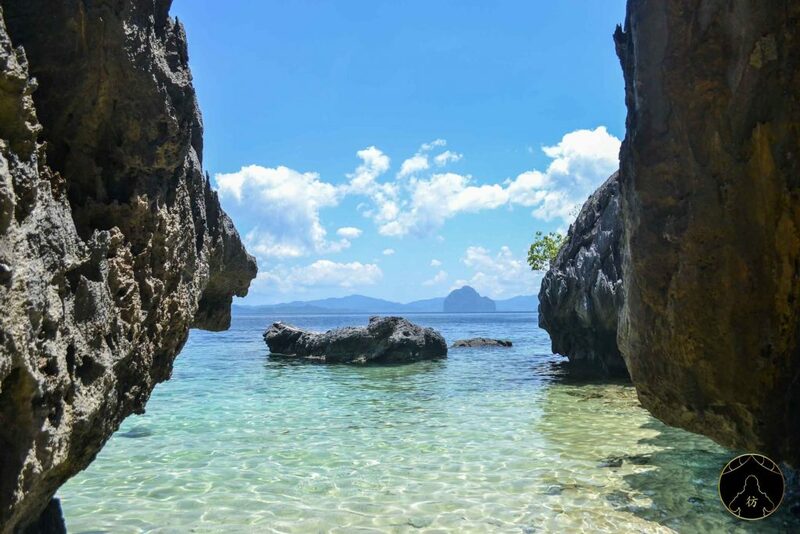 Travel by plane from Manila to Lio Airport, situated 4 km away from El Nido. 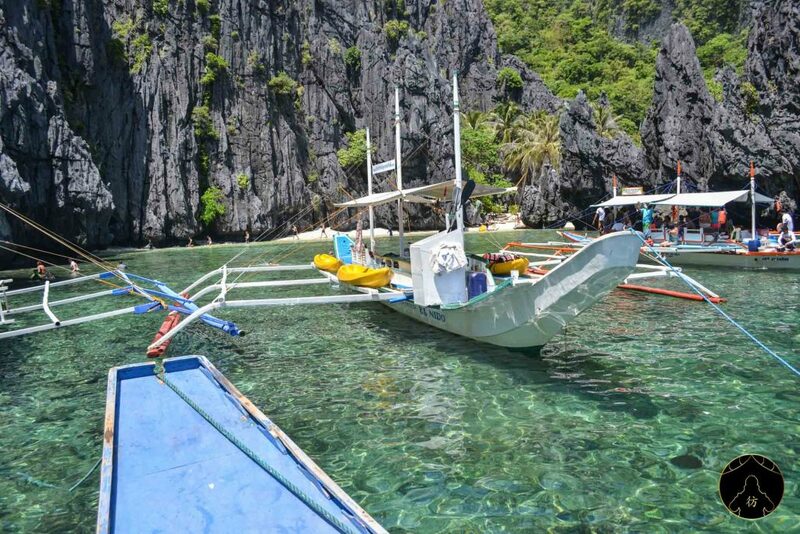 It might be the fastest way to El Nido but it’s also the most expensive. 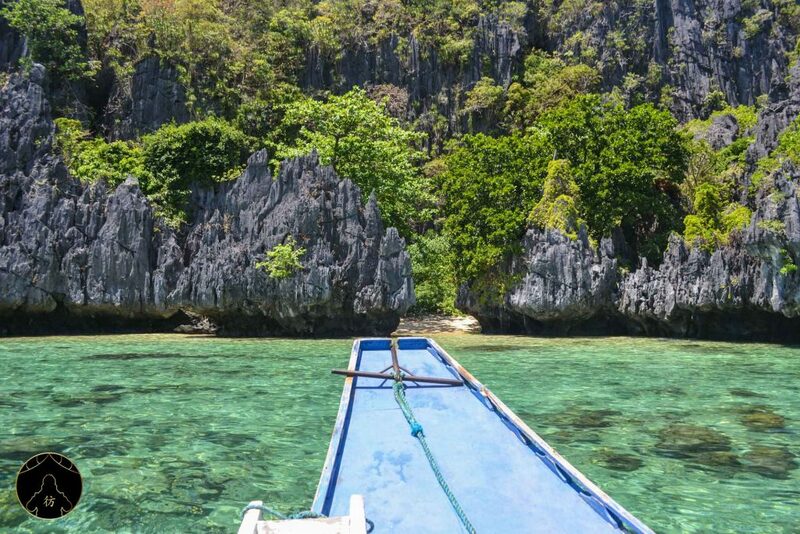 Travel by boat To El Nido from Coron. The journey will be a long one but at least you’ll get to enjoy the landscape for 4 hours with the fast ferry. Flying from Manila to Puerto Princessa seems to be the most convenient way to go to El Nido. The Puerto Princessa Airport is the biggest of all Palawan airports so flights from Manila will not be very expensive (expect 1h15min roundtrip flights for $60 to $80). 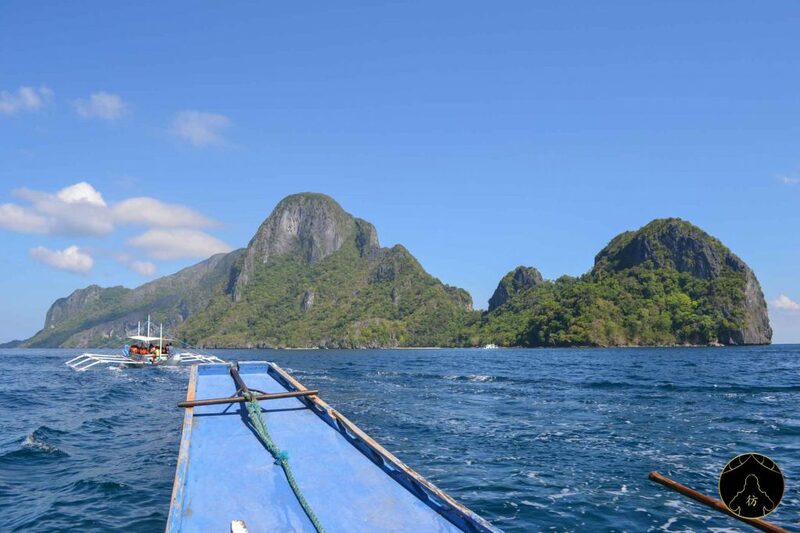 From Puerto Princessa, you’ll have to take a minibus to El Nido. The trip lasts around 5 hours and you can book your ticket online here. There you have it, let’s talk about accommodation now. 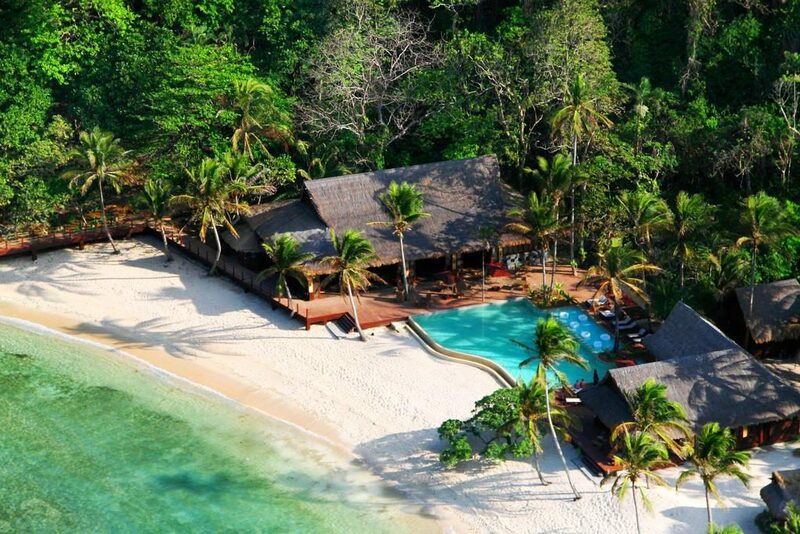 El Nido has hotels to satisfy every traveler’s whims and budgets. I recommend this cheap hostel for backpackers. I stayed there for two nights and it was a decent hostel. If you have more budget to spend on accommodation, you can try this more comfortable hotel, pictures below! If you’re traveling with a partner or for your honeymoon, El Nido offers stunning resorts for unforgettable memory-making moments! I had the opportunity to visit this resort and was blown away by the dreamy setting. 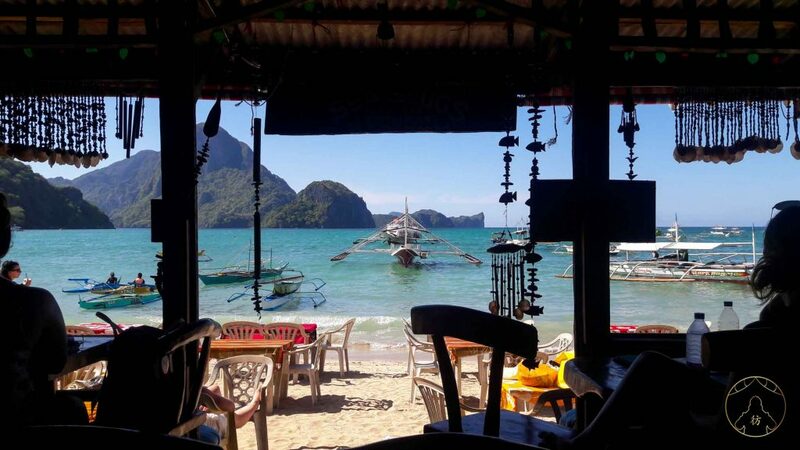 Let me tell you this: you might be a bit disappointed when you first get to El Nido, I know I was! The city’s beach is a very ordinary beach and you will hardly recognize the picture-postcard scenery you’re excited to see. Don’t panic! Let me explain. El Nido’s heavenly spots are not in the city but around it so it’s kind of a starting point to explore the stunning islands surrounding it. To do so, you will have to choose between 4 island tours (A, B, C and D) so I asked some friends back at the hostel and all of them seemed to agree that tour A was the best one so I decided it to try it out. You can book the tour A online here. 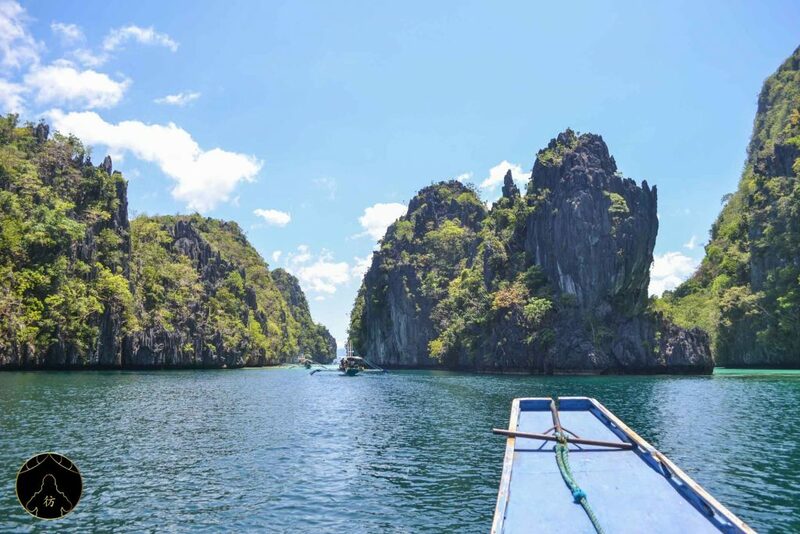 In the morning, you will get on a boat from El Nido (the exact schedule varies depending on the agency organizing the trip) to Small Lagoon. I can guarantee you will be blown away as soon as the trip starts. 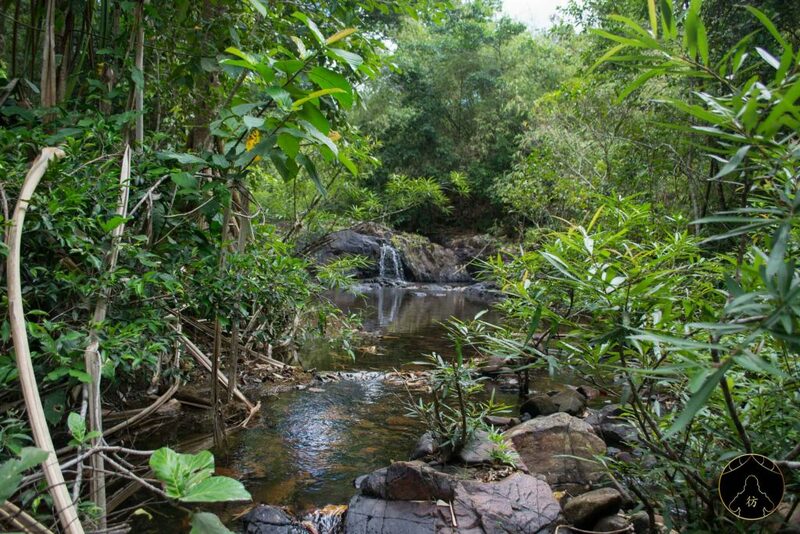 In the picture below, if you look closely towards the center, there’s a small entry leading to a beautiful lagoon you cannot see yet. So you will start your day with a refreshing swim and some relaxation and will move on to the next activity. You can kayak your way into Small Lagoon but you will have to pay an extra $5 to $6 for that. You won’t necessarily be informed of this before you hop on the kayak, which kind of pissed me off but I lived to tell the tale! Anyway, I think the kayak trip was worth the extra pennies and it’s the easiest way to get to Small Lagoon so I recommend you go for it. 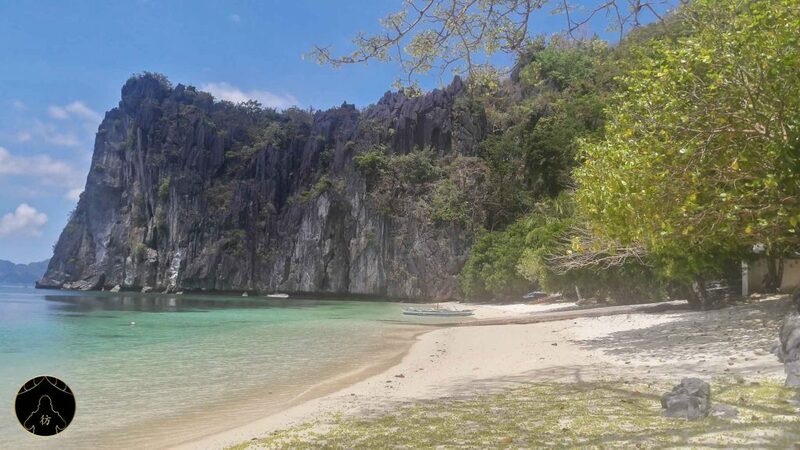 You can also snorkel in Small Lagoon but honestly, I wasn’t really impressed by El Nido’s marine fauna and flora and I’m sure mass tourism has something (a lot of things actually) to do with that. So you can do something for the environment by travelling responsibly, not throwing anything in the sea for example and trying to limit your impact as soon as you can. If you’re into diving and you’d like to try something fun, I recommend Port Barton which is also in Palawan. By the way, jellyfish are common in El Nido’s lagoons so be careful and avoid them when you’re swimming! You will then pass by Big Lagoon. As you can see in the picture below, the landscape is spectacular enough to make you feel like you’re part of an actual postcard setting. 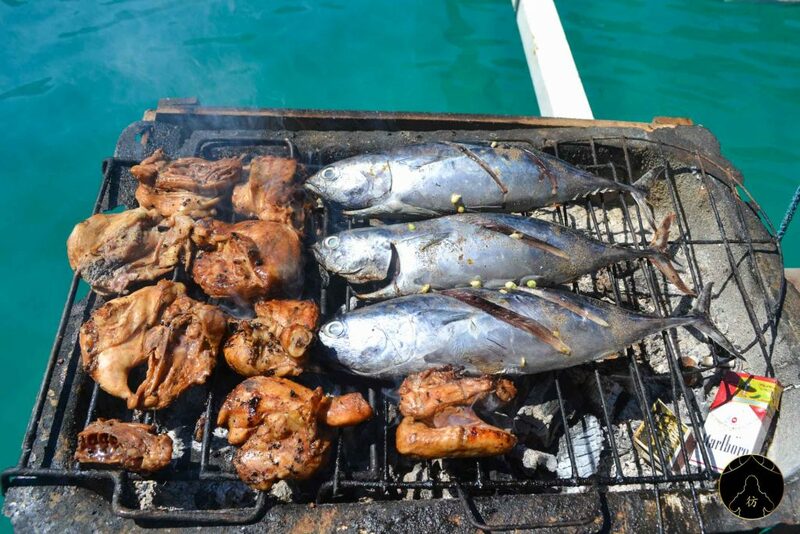 You will cross Big Lagoon and head to Secret Lagoon where you will anchor the boat and have a nice meal of fish and grilled chicken. You’ll also have some rice to go with the meat and some fruit for dessert. Keep in mind that you won’t have to pay for lunch, it’s included in the price you pay for the tour. It’s called Secret Lagoon because you can’t really see it from a certain distance and you can only access it through a tiny entrance. 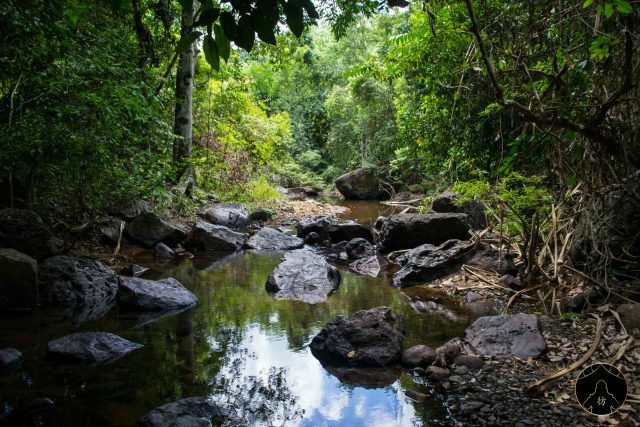 It doesn’t look like much at first but once you get there, you’ll be surprised at the hidden piece of heaven you will find! Secret Lagoon is located towards the left in the picture below. If you look closely, there’s a line of people on the beach heading towards the lagoon. 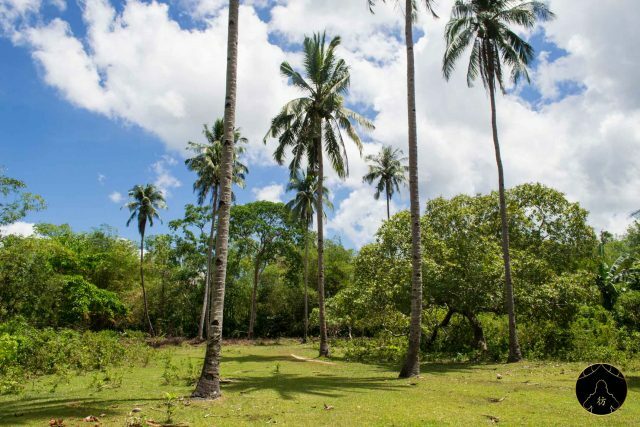 Before visiting Seven Commando beach, we stopped over to take a short nap under coconut trees in a nearby beach. Life can be so hard sometimes that you need to rest in paradise after a meal! We finally get to Seven Commando beach where you can either play volleyball or you can simply stay on the boat and sunbathe as much as you need to. You’ll have to swim your way to the beach because the water isn’t deep enough for boats to get closer to the shore. 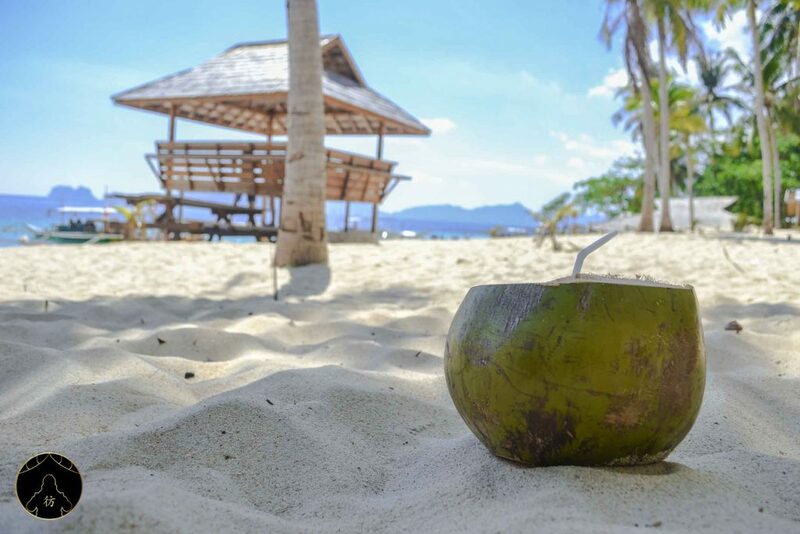 … and sip on on a coconut (that you’ll have to pay for). I don’t particularly enjoy coconut water but apparently, it’s good for you! …and trying its great beach restaurants. How gorgeous is this view? As for the other tours, below is a list of what each package offers along with their cost. To help you choose your trip and since I haven’t tried all of them, you’ll also find travel videos of each tour. 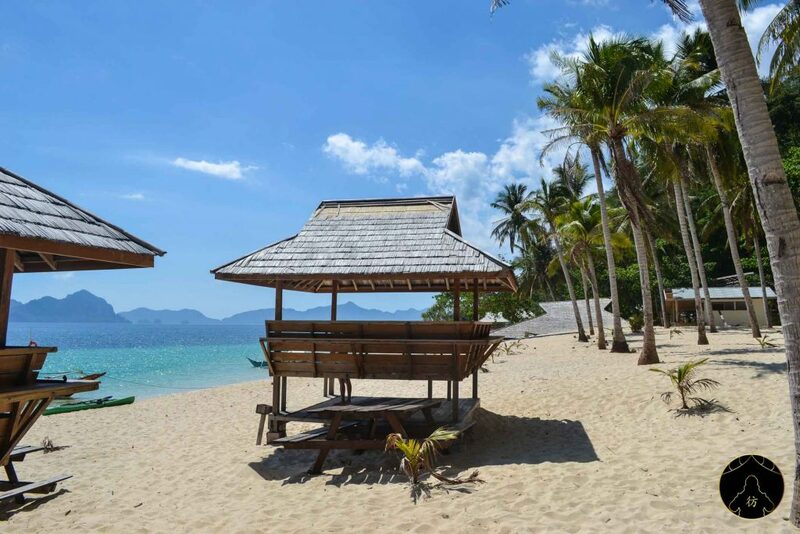 But the way, if you are looking for more areas with beautiful beaches in the Philippines, make sure you check out this blog post: Best Beaches in Philippines. 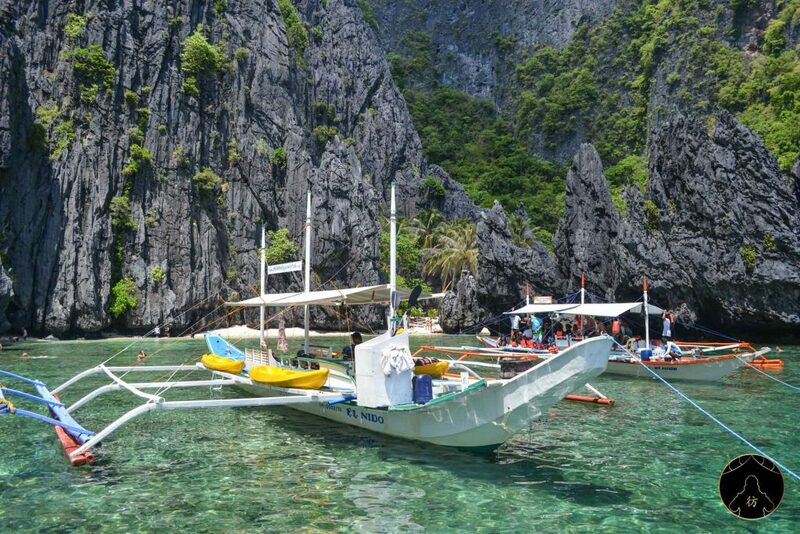 If you’d like to try more island hopping tours, try tour C. Many people in El Nido seem to recommend it. I haven’t tried it but it looks promising! 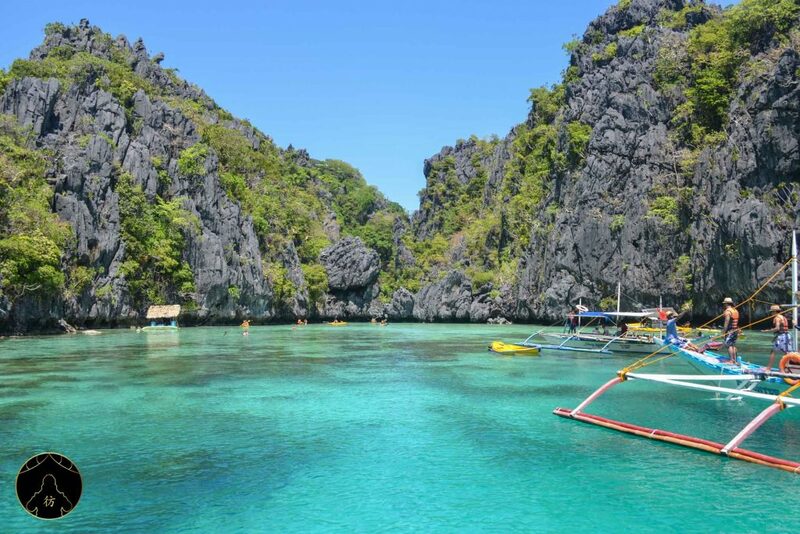 If you’re thirsty for more sandy beaches, sunbathing and swimming, El Nido has many other beaches you can visit. One of my favorite is Lapus Lapus beach which is located here. The only way you can get there is by kayaking from Corong Corong but you’ll have to rent a kayak first! Many hotels offer kayaks for rent for around 500 pesos per day, which is around $9. I rented mine when I stayed in this hotel. 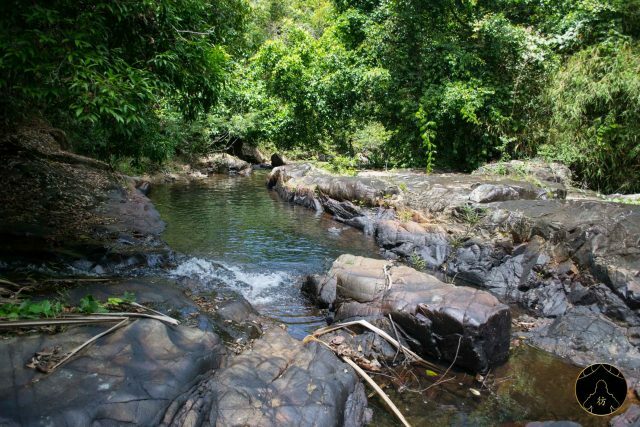 At Lapus Lapus beach, there are wondrous rocky outcrops that magically challenge gravity! You’ll most probably have the beach to yourself; not everyone rents a kayak to explore hidden beaches so enjoy calm and tranquility as a reward! 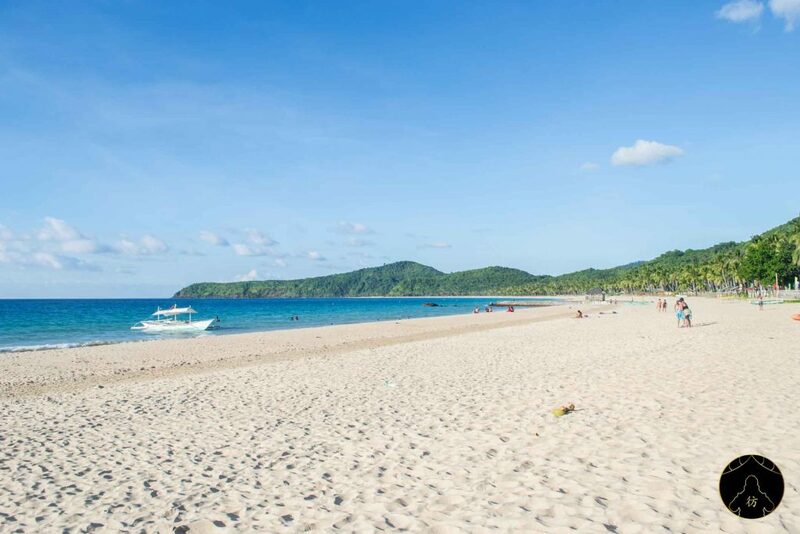 Las Cabanas Beach is another beautiful beach not too far from El Nido. The exact location is here. To go there, you can rent a tricycle that will cost you around $1 to $2. The beach is also much appreciated for its sunsets and there’s always a picture to prove it. To get to the following beaches, you’ll need to rent a scooter. 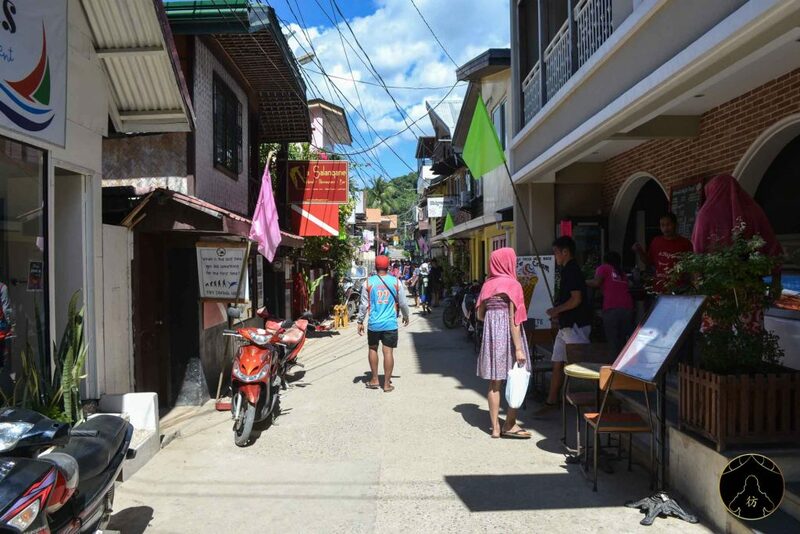 Many rental agencies in town rent scooters for $9 a day. Don’t forget that a scooter is a means of transportation, not a toy of some sort. It’s always sad to see travelers ruin their holidays because of scooter accidents so be careful not to ruin yours! 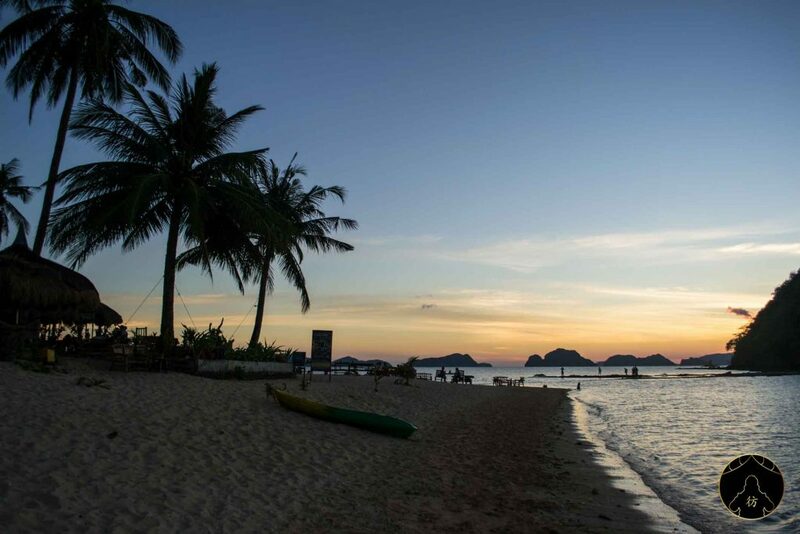 Nacpan Beach (located here) is one of the most popular beaches in El Nido. You can rent a tricycle to go there but it’s not the most comfortable way, nor is it the fastest! 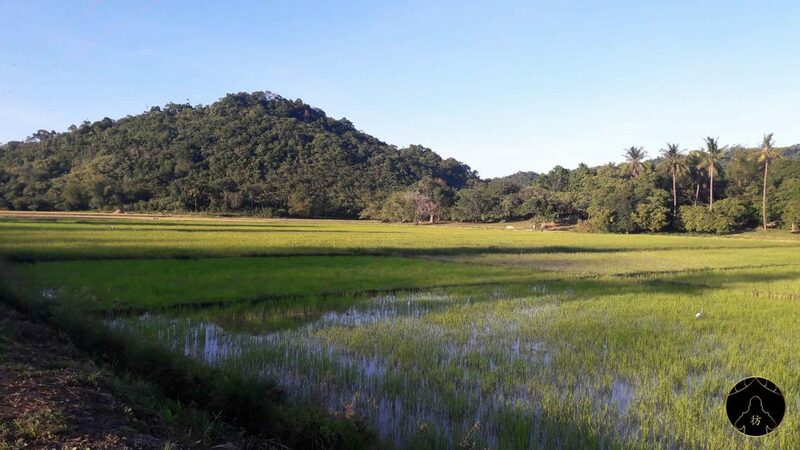 Just rent a scooter and you will get there in about 45 minutes and enjoy the landscape and the rice fields on your way. You can use this tip to never get lost while traveling. The road turns into a track at some point so be extra careful. You’ll have to write down your name on a registry and pay $1 to access the beach. You can then park your scooter and enjoy the sand. If you’re looking for accommodation in Nacpan Beach while avoiding tourist crowds, I’m sure you’ll like this hotel. 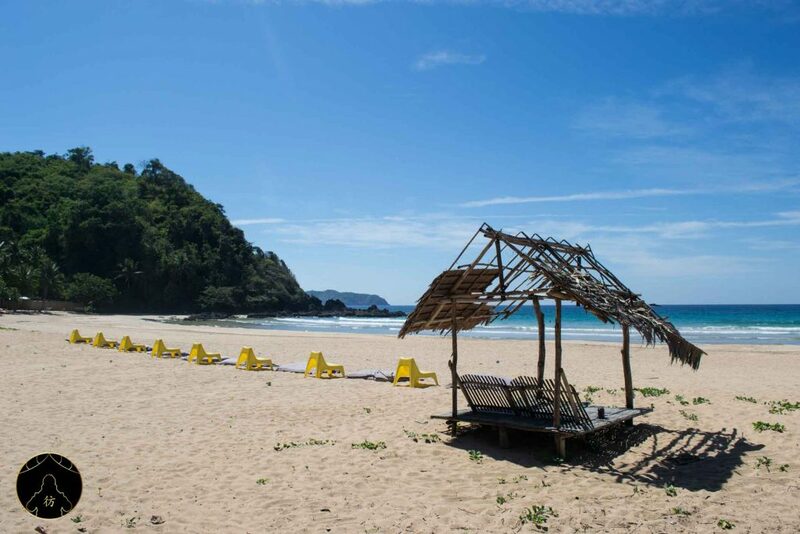 Duli Beach (located here) is not as popular as Nacpan Beach but it’s becoming more and more visited and liked by travelers. It’s also an ideal spot for amateur surfers. 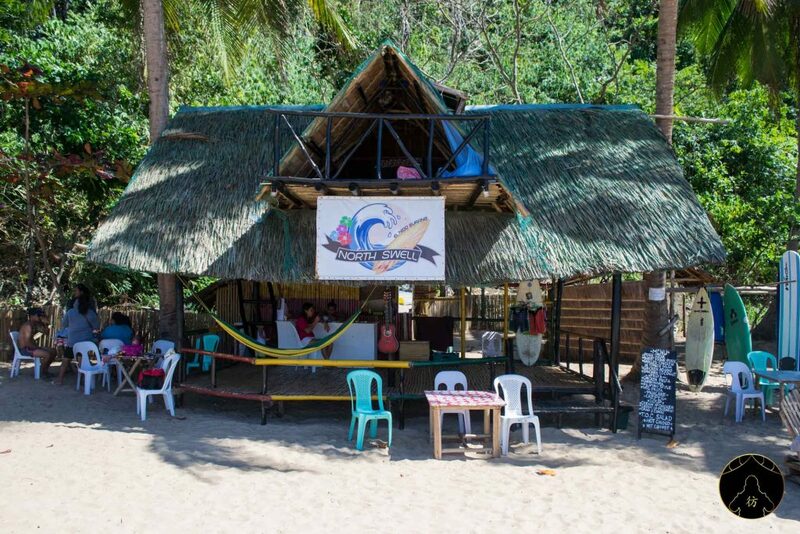 The North Swell is in fact a restaurant where you can book affordable surfing classes. As for the beach, it’s just as enjoyable as Nacpan Beach, with less tourists. The Nagkalit-kalit waterfalls is yet another spot that is not so popular in El Nido and that I really liked. They’re not very far from Nacpan, here’s their exact location. You’ll need a scooter to go there, you’ll have to park it on the main road and continue walking until you get to the waterfalls. I visited the Nagkalit-kalit waterfalls in March so it was the dry season and not much water falling down for a waterfall but it was really beautiful! There will be tour guides on the spot to help you explore the area but I preferred to be on my own. 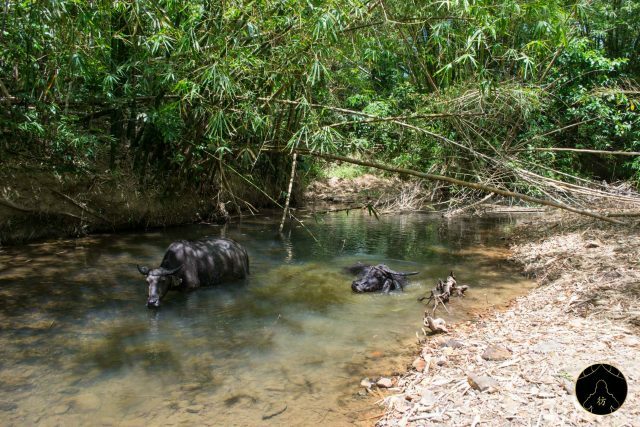 I went up the river and through fields of coconut trees, bamboo forests and a lot more mystical landscapes. It’s truly one of the best memories I keep from El Nido. This time, don’t expect to have to have the whole forest to yourself. 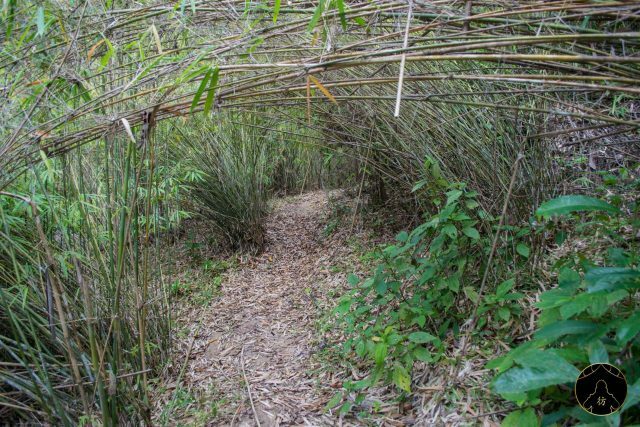 You’ll meet a few wild animals here and there, mostly salamander, frogs and a few birds. 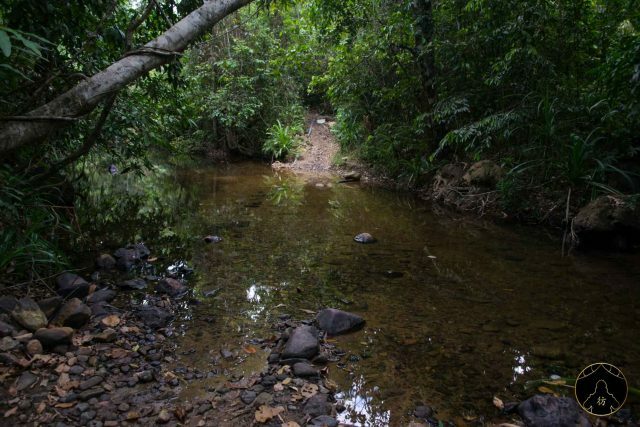 I did see a monitor lizard that must have been more than a meter long. It was on my way and I had kind of a dramatic reaction. I literally froze. The lizard didn’t see me at first but when he did, we both froze. We kept looking at each other. I maintained a solid poker face for a while then couldn’t handle the intensity of the moment and ended up yelling kamehameha! 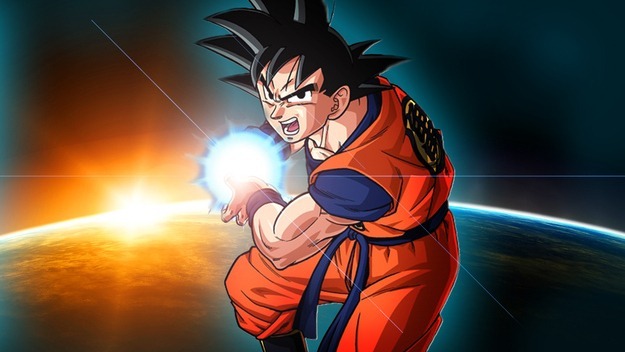 You can laugh all you want but at least it worked and I can now say that a good ol’ kamehameha saved my life! There you go, I think you’ve got your daily dose of sand and beaches. 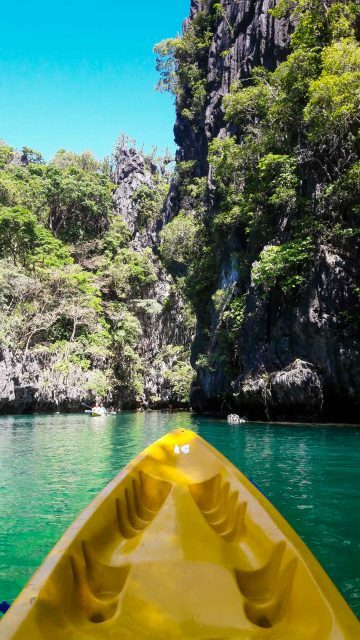 El Nido is definitely a tourist destination but if you do have the opportunity to visit it, do not hesitate! The landscape alone is worth the trip. Make sure to check out the less popular spots I told you about, they will be much less crowded and just as memorable. If you’re looking to spend more quality time on beautiful beaches surrounded by calm and tranquility, I recommend you visit Port Barton. Don’t forget to follow me on Facebook, Instagram and Pinterest to never miss the latest blog posts and post all your questions to our growing community on our Facebook Group. 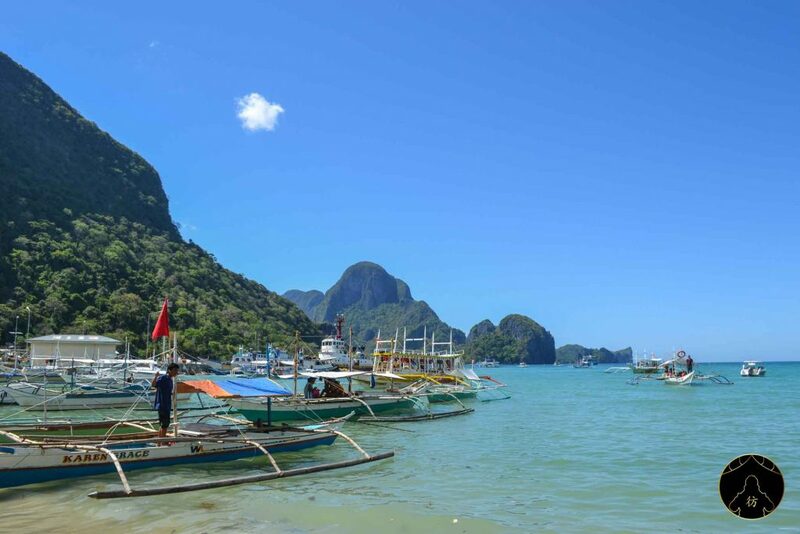 Thanks for your post, the truth that clarifies many questions about El Nido. 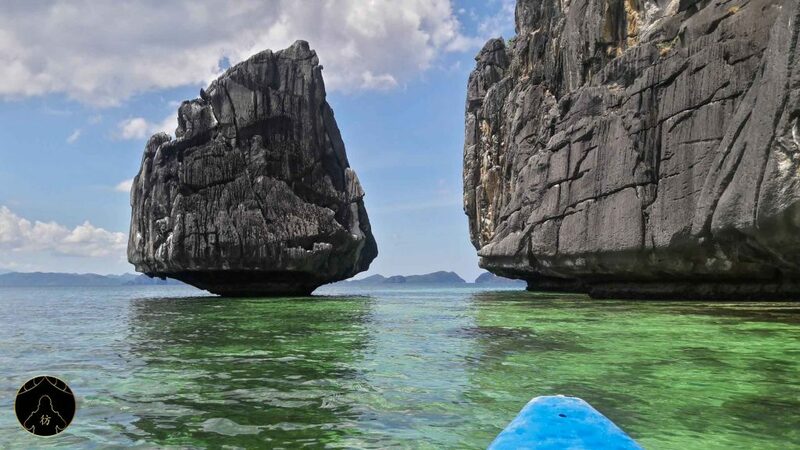 It is true that El nido has many tourist attractions. On the contrary, it is a very oppressive city with a lot of traffic, just like all the big cities of the world. But it’s still a paradise. This is a great post! We run ESTEL Magazine the town’s tourism magazine and are always looking for any new info on what we may have missed. Your post has done a great job!